ContempoSuits.com is a great online website store where to buy men's vintage style zoot suit or even a Tuxedo because we stock our zoot suits on sale because fast shipping is our priority. Don't go wearing a boring old suit to your Prom. Vintage style 1940s era Zoot Suits for Prom have been the thing to wear lately for Juniors and Seniors all over the country Read Articles about Zoot Suits Here. Many of our customers buy our men's fashion suits including our inexpensive Zoot Suits online for Costume Parties and Halloween as well. Forget about dressing like a Pirate or Vampire when you learn where to buy inexpensive Zoot Suits that make fantastic costumes for Halloween. Don't waste your money on a so called zoot suit costume when you can learn where to buy the real thing here on sale for a great price. We are a zoot suit online store that carries all the accessories you need. We also carry plenty of matching color shoes for mens fashion suits including all of our zoot suits and zoot suit hats. Perhaps you're into Swing Dancing and want to dress like the cool cats of the 1940s back in Zoot Suit History. Well you're going to need a zoot suit. You'll be bopping in no time to the beat when that long jacket is bouncing around. Make sure you have that matching Homburg Hat on with the feather in it to complete your look. Whether you spell it Zoot Suit or Zuit Suit. We always have Zoot Suits on Sale. You don't have to be a Pachuco to wear love wearing them. Maybe you have questions on how to Wear a Zoot Suit. Check Here for History of Zoot Suits. Read More about Zoot Suits for Men. 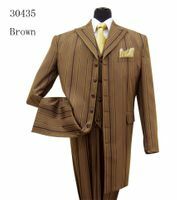 If you are looking to find cheap Zoot Suits online, ContempoSuits.com is the place for you. Shopping Online for a zoot suit online and zoot suit accessories online is easy at ContempoSuits.com with Free Shipping over $99. ContempoSuits.com is a website for Zoot Suits. If you're so inclined, check out our selection of Mens Walking Suits. Need a flashy style Dinner Jacket for a party. Chances are you're going to need some new zoot suit shoes as well. You should also check out our huge selection of affordable Mens Suits. Shop for Fedora Hats Here. Don't forget to checkout our selection of Stacy Adams Suits Here. Want to know more about How to Wear a Zoot Suit. 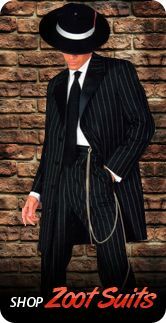 You can buy the same style of gangster style zoot suits that you will see in both gangster movies and television shows as well as all the fancy shirts and dress shoes online to go with them. Find tons of choices of Men's Blazers Here. Checkout our Huge Collection of Urban Men Suits Here. Don't forget to shop our Great Selection of Crocodile Shoes Here. If you like Zoot Suits, you'll need some matching Stacy Adams Madison Shoes. If it's cold outside, you may want to checkout our Wool Overcoats. In terms of fit and looks, the opposite of a zoot suit are Linen Suits with their casual look. Zoot Suits have a Colorful History. Here is a little online Zoot Suit History to know about. People have an inherent nature to be free and not be told what to do and even how to dress. Some people prefer to dress like every one else and some utterly refuse to dress in a fashion that is deemed acceptable by the society at large or even fashionable for that matter. During the 1930s a strange new style of cheap men's suits appeared worn by Pachuco men who are South Western Mexican American men, a cheap style suit that was never seen before from the inner cities and barrios of the United States. A dress suit that just wasn't meant to let the wearer blend in with the rest of the crowd. A dress suit simply designed to be outrageous. I'm talking about the zoot suit. Zoot Suits for men back then were a prime example of counter culture in a way that was not much different than Hippies growing their hair long during the 1960s in defiance of societies norms which is just what counter culture Pachuco men favored. The Zoot suit are men's suits that have outrageously long dress suit jackets with overly padded shoulders, extra baggy pants and peg leg style cuffs on the bottom of the pants. There is simply nothing mainstream about these long jacket get ups in any way shape or form. I'm pretty sure that the first time you ever saw one of these wild looking suits, you were either watching a movie or a television show unless you're old enough to remember when men wore them for real. Visual impact is certainly what should come to mind when you see someone wearing one. The man in this type of suit wants to showcase his bravado and be noticed in a way that let's people know that he is not a man to take lightly and won't be pushed around. It's pure machismo. The Zoot Suit Started as a Counter Culture. The original zoot suit had to look as counter culture and anti conservative as possible. Exaggeration is the word that sums up the zoot suit the best in my opinion. The way it fits simply has to be the very opposite of what your standard business suit should look like. Where a regular suit is supposed to be tailored looking or standard fitting, these bad boys have to be baggy as baggy can be. On a regular suit, the shoulders are supposed to be exactly the width of the man wearing it. On a Zoot suit, those shoulders of the jacket look like they are going to the next county over. Where the lapels on a regular suit are supposed to be medium width and not draw attention to the suit, You guessed it. you get the complete opposite with a zoot suit. The lapels may be wide and brash looking drawing complete attention to the suit. Of course one of the main differences that sets these suits apart from a regular suit is the length of jacket. A standard suit length generally breaks right at the hip of the man for a proper fit where the zoot suit jacket comes down the thigh as close to knees as possible for an over the top look. Everything that a zoot suit is just smacks of a counter culture that was bent on defying what a man is supposed to wear in public. The best type of suits were always tailored garments that were created to fit the wearer in a manner that looked like they were personally made for that man. A dress suit jacket that fit properly and slacks that fit as well. When you put on a suit, you were simply putting your best foot forward and wanted to look your very best in public with an air of respectability. The zoot suit on the other hand does the complete opposite. There was nothing about a discount zoot suit for men that has a tailored look to it. It takes everything that you know about a suit and the way it's supposed to fit and make you look and throws that right out of the window. Zoot Suits have long jackets. You're not supposed to look like a banker, business man or lawyer when you wear these over the top looking get ups. These are baggy style suits and look like you are trying to offend someone of the geriatric persuasion. It's really no different than the Hippies who grew their hair long and wore outrageous clothing that looked anything but mainstream and conservative. You can almost hear an old man or old lady muttering to his or herself , "Who does that person think he is wearing a suit that looks like that?" That is exactly what zoot suits were invented for. To outrage people. To get a reaction the way someone with their hair painted pink would. It didn't take long before zoot suits were seen all over country in every metropolitan area worn on countless young men of African American or Mexican American persuasion known as Pachucos as their own counter culture message. It's the same reason that even today, teenagers and young men always dress in a manner that is completely different than a grown man would dress. Depending on the era, baggy jeans of several years ago hanging off of their back sides that are several sizes too big and now skinny jeans that are so tight and worn also hanging off their butts that they have to walk in a certain manner just to move around. Teenagers always like to do their own thing as a way that gives them some sort of identity that tells the world that they are adults even though their behavior tells you otherwise. You look at any teenager out there whether you are in the big city or in the suburban areas and you will find an overwhelming consensus that they think that just because they went through puberty, they thing they are adults even though they way they conduct themselves is anything but adult like. You would see young men zuit suiters strutting down the street with their wide padded shoulders and high waist slacks and huge brim fedora hats knowing that were it. Coming straight out from stores that sell zuit suits. That is the type of attitude that wearing a discount zoot suit could give you back then. Not much different than today's youth wearing overly baggy jeans and shirts with their baseball hats on backwards. Zoot Suits were Banned During World War Two. Once World War 2 was well underway, zoot suits became banned for several reasons. One of them being that everything was being rationed during those days including the material being made into suits, so making a baggy long jacket dress suit for men was wasting material when either that material could be used to be made into more regular designed dress suits, or factory capacity to make material for war materials. A second reason is that the US government didn't want anyone wearing dress clothes or men's fashion clothes that convey an attitude that they weren't part of the war effort. Uncle Sam wanted everyone to pitch into the war effort and that means you Mr. Zoot Suit man. These days, most people who wear zoot suits, wear them for entirely different reasons. There are many men who will wear a these bold ensembles for a fun filled evening wear outfit that will no doubt have the beer and wine flowing freely. There also many men who wear these outrageous long jacket suits for swing dancing for a completely nostalgic feeling bringing back the 1940s with swing dance music going wild. Bringing back nostalgic times has been the major reason that anyone these days will put on a zoot suit and believe it or not, you will find that wearing one will still get the same exact reactions that they did back in the 1930s by people. Zoot Suits are Fun To Wear. It's a fun way to get noticed and start a conversation with complete strangers just like men were able to do way back in the 1930s. When you wear one to a costume party or swing dance event, you will be surprised how many people will be curious about your zoot suit and want to know all about it and where you got it. "Is this the first time you ever wore a zoot suit". What is it made of? Etc, etc..One of our biggest reasons for keeping the zoot suits alive is the fact that without fail every Halloween, men all over America wear zoot suits as their costume of choice. It just goes to show that when it comes to costumes, you can't go wrong wearing one of outrageous looking suits. You can thank Hollywood for keeping the zoot suit alive because every time they make a movie that takes place in the 1930s, you can bet your bottom dollar that they will have a man or two hanging out on a street corner completely done up wearing one of these long jacket wide shouldered suits with the huge brim hat and feather. Every time they put a couple zuit suiters into a movie and it seems to reinvigorate interest in these long jacket style suits and start selling again for a while. Every few years there is an iconic movie that comes out whether it's a World War Two movie or during the great depression during the 1930s maybe with gangsters in it like Bonnie and Clyde or a movie about John Dillinger and you more than likely see a couple guys wearing a zoot suit just standing around as added eye candy for the movie to instill realism for the shot. Just like when they have all of cars being 1930s period automobiles driving around or parked and changing store front signs to vintage looking signs to make the set look as 1930s as possible. The zoot suit is always included in a style of the day item that instantly transforms that sidewalk from modern times to the 1930s in way that nothing else can. What ever you want to say about these wild looking suits, you can never say that they are mundane and boring. It's like a walking one man three ring circus. If Style is What You Crave, checkout our Huge Selection of Mens Fashion Suits. Get your exotic side going with hand made crocodile shoes by Belvedere Shoes. If you really appreciate nicer menswear consider Silversilk Menswear.